Paris Las Vegas is owned and operated by Caesars Entertainment Corp.. As its name suggests, its theme is the city of Paris in France; it includes a half scale, 541-foot-tall (164.6 m) replica of the Eiffel Tower, a sign in the shape of the Montgolfier balloon, a two-thirds size Arc de Triomphe, a replica of La Fontaine des Mers, and a 1,200-seat theatre called Le Théâtre des Arts. The front of the hotel suggests the Paris Opera House and the Louvre. Casino: Yes, 85,000-square-foot casino with 100 table games including Blackjack, Craps, Roulette, more than 2,200 slot and video poker machines, and a high-limit slots and table game area. Race & Sports Book: Yes, a 265-seat race and sports book, equipped with 221 televisions and 11 big screens. Restaurants: Paris has the following dining options: Café Belle Madeleine, Eiffel Tower Restaurant, Les Artistes Steakhouse, Mon Ami Gabi, Le Provençal, Le Village Buffet, du Parc, Le Café Île St. Louis, JJ’s Boulangerie, La Creperie, Sugar Factory and Le Burger Brasserie Sports Grille. Entertainment: Entertainment can be found at several lounges. Barry Manilow performs in the Paris Theater. Anthony Cools – The Uncensored Hypnotist amazes audiences at the Anthony Cools Experience. The Magic of Paris is another show option. Nightlife: Chateau Nightclub & Beer Garden , a 45,000-square-foot nightclub with an outdoor terrace. Bars throughout the property. Pool: Yes, one octagon-shaped pool and two Jacuzzis. Spa: Yes, the Spa by Mandara offers multiple types of massages and services. The spa also has a full-service salon. 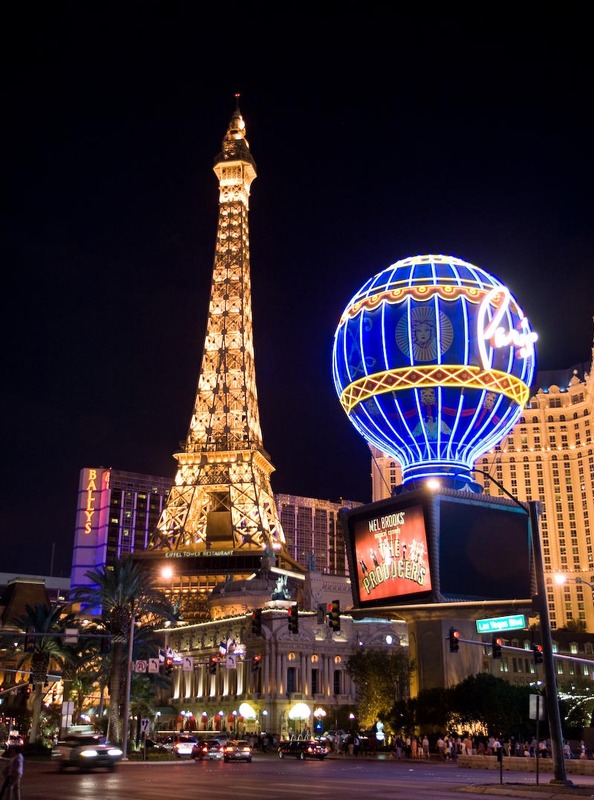 Shops: Paris Las Vegas offers about 20 restaurants and shops throughout Le Boulevard. Wedding Services: Yes, the Paris Chapel offers a number of wedding ceremony packages. Business Center: Yes, located in the indoor avenue of shops that connects Bally’s and Paris casinos. Open Sunday – Thursday 6 a.m. – 7 p.m. and Friday – Saturday, 7 a.m. – 7 p.m.
Convention Rooms: Yes, 140,000 square feet of pillarless meeting space. In-Room Internet Access: Yes, with high-speed Internet access. Standard Room Amenities: Air conditioning, desk, electronic door locks, in-room safe, iron and ironing board, hair dryer, alarm clock/radio, remote-controlled cable TV, telephone, voice mail, pay-per-view movies. Standard Room Amenities: Concierge, currency exchange, safety deposit box, car rental, laundry, luggage and maid service, wake-up call. Policies: Rates are for single or double occupancy only. An additional person rate of $30 per person, per night will be charged, regardless of age. Incidental Charges: Hotel requires a credit card for incidental charges.